Make your training sessions relevant to you and make them fit intelligently with the rest of your weekly schedule. For example, if you know that tonight’s class is heavily cardio based, Muay Thai for example, then focus on something that won’t hinder that…. 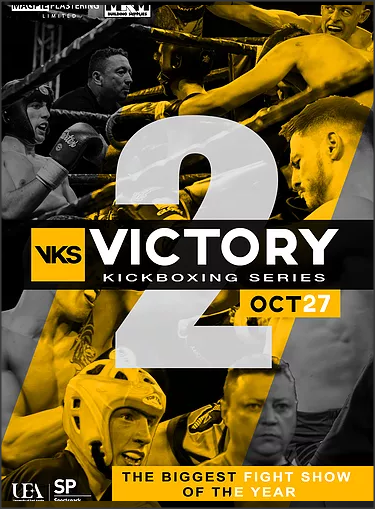 We had a great night representing local K1 at the fantastic Victory kickboxing series at the UEA Norwich. Whilst we didn’t get the results we wanted, our novice K1 fighters learned a lot and took much from it. Claudio showed more heart and spirit than we have seen in a long, long time. He started of a little slower than we would have hoped but in the middle to latter part of the fight, dominated the shots, throwing more and causing his taller opponent some trouble, His opponent threw some nasty front kicks to Claudio’s head but he battled through and lost a close split decision. Claudio will be back stronger and will fight at his more natural lower weight. Dan came out with enough energy to power a small town and really ignited the crowd. Whilst the energy was there, his focussed was not where it needed to be. He showed some great improvements from his first fight but he didn’t quite show his full potential and prove to everyone the great fighter that he is. Whilst he was ok to continue, he didn’t show the referee this, so the ref had no choice but to stop the fight after a knockdown. Both our fighters showed heart, skill and willing and we have no doubt they will take things to the next level for Iceni Warriors. Is there such a thing as the best diet? So, What’s the “best diet” for people to follow? Despite how many times I have been asked this, I still don't have a quick answer and usually, it's answered with another question or mostly several probing questions. This is why; I don’t believe there’s a single, 100% perfect diet for every person to follow for the rest of their life, there are too many potential variables to consider and these variables even change as one gets older, or sadly if people develop a health condition etc. • Budget: Some people have a very low budget to have to manage, others come with an unlimited budget. • Existing knowledge: Some people already have a huge knowledge of one particular way of eating/living healthy and are almost cult-like in their following of this. Others come with very little nutrition knowledge whatsoever. • Time: Some people have huge amounts of freedom to spend time preparing and sticking to every corner of their rule book. Others come with very little time to devote to health and fitness (the latter I would question strongly). "The best coaches don’t actually have a single nutrition philosophy"
If a certain way of living, such as Paleo or Vegan worked for you personally, that’s great. However, just because it worked for you, at one point in your life, under a particular set of circumstances, it certainly doesn't mean everyone else should follow the same program that's both short-sighted and a little crazy. Any good coaching is about being open-minded and accepting of different philosophies. Our bodies are able to deal well with lots of different nutritional changes and envirnonments. Just take a look at the nutritional diversity across the globe, in different tribes, this varies greatly. When doing my studying for my nutrional qualification, I saw huge variances, for example, in the food pyramids, charts, squares, trees or whatever each relative health organisation chooses to utilise. The Arctic Inuit and African Masai eat traditional diets that are very high in fat and animal products with very few vegetables. In contrast to this, in the South Pacific, a specific tribe eats traditional diets that are low in fat but very high in vegetables and starchy carbs. The Tokelau near New Zealand eats traditional diets that are very high in saturated fats. All are relatively healthy people with minimal incidences of cardiovascular disease, stroke, diabetes, inflammatory obesity, etc. The human body can adapt and is able to across a wide range of nutritional conditions. So hang on a minute, you have read all of this and there is no conclusion as to what is the best diet for you? Nope, there is as I said from the start, another set of questions that are fired back to you. However, let's start with a demand from me first. If you are not happy with your current diet then what about it is making you unhappy? As in what results are you getting or not getting and that is/are making you dissatisfied? Answer this first, then we can start a food diary before you start to make any changes. If you are based in Norwich or Norfolk and you would like some free nutritional or specifcially, martial arts nutritional advice, and want to make some changes, either by losing weight, gaining muscle, toning up, getting ready for a competition, wanting to get stronger for either an MMA fight, Thai Boxing bout or BJJ competition. Then contact us either via any of the social media platforms, telephone or email. Sometimes you win, sometimes you lose and sometimes you draw, you always learn! Outcomes are not always what you want them to be, and to be undefeated, especially in fight sports other than boxing, is an unrealistic expectation. That is unless you take easy fights that you know you can win, and trust me, this happens and those who take that path will only come to the end of their journey unfulfilled and with too many unanswered questions. Sure this still happens in boxing but it does nothing positive for the sport. We all want to see the best fight the best, surely? So far this year we have had some mixed results, back in February Brad lost on points to a very game opponent at the Road to the Muay Thai Grand Prix at the Troxy in London. His opponent was tall, rangy and very skilled. Brad fought over five rounds never retreating and never giving up. It was back and forth for a lot of the rounds but the range was a big factor and essentially what won the fight for Brad's opponent. Loads to learn from this and certainly a great showcase of talent on the night for all the Iceni team to learn from. Alfie just before the storm. Brad throwing some shapes in background. In April at the Gorleston Ocean Rooms we had three first time fighters; Marius, Charlie, and Alfie. First up was Alfie with a very, very close fight with both young lads showing heart and spirit. The first round was Alfie's opponent's round, with big punches being thrown from all angles and with huge ferocity. Alfie weathered the storm and dug deep to finish the round stronger than he started. The second round his opponent started strong but Alfie came back at him with some strong shots, the same could also be said of the final round. The fight ended in a draw but more importantly, both fighters would have learned a lot about themselves, also the crowd loved it! Charlie's shiner from the fight, still smiling though! Charlie was up next and whilst he did well in the first few exchanges, his opponent was throwing absolutely everything he had and was determined not to go home with anything less than a win. This was Charlie's first ever fight and his opponent's second fight, so that extra bit of experienced, combined with the home crowd support for his opponent and a few small mistakes on Charlie's part, unfortunately, this was not his night. Loads to learn from this and iI think if the fight was run through again, the outcome would be the opposite, and it won't take long before he puts that 'W' on his record. Last up was the heavyweight, power puncher that is Marius. From the opening bell, Marius' opponent through a big kick that Marius checked but in doing so injured his leg. This was in his head throughout the fight and left Marius a little hesitant when moving forward. This didn't really make much difference though, almost every punch Marius hit his opponent with looked like it may end the fight, which in the end it did. It certainly wasn't the most elegant or technical of fights to watch but was definitely a crowd pleaser. Marius has only been training with us for a very short while so this was always going to be a bit of a warm-up fight, and with it being so difficult to match heavyweight beginners, it's great to get in there early and get the experience. Big win for Marius and plenty more where that came from! Marius getting his leg iced after a heavyweight war!